As we saw in the technical overview, all Authentication implementations store a list of GrantedAuthority objects. These represent the authorities that have been granted to the principal. The GrantedAuthority objects are inserted into the Authentication object by the AuthenticationManager and are later read by AccessDecisionManagers when making authorization decisions. This method allows AccessDecisionManagers to obtain a precise String representation of the GrantedAuthority. By returning a representation as a String, a GrantedAuthority can be easily “read” by most AccessDecisionManagers. If a GrantedAuthority cannot be precisely represented as a String, the GrantedAuthority is considered “complex” and getAuthority() must return null. An example of a “complex” GrantedAuthority would be an implementation that stores a list of operations and authority thresholds that apply to different customer account numbers. Representing this complex GrantedAuthority as a String would be quite difficult, and as a result the getAuthority() method should return null. This will indicate to any AccessDecisionManager that it will need to specifically support the GrantedAuthority implementation in order to understand its contents. Spring Security includes one concrete GrantedAuthority implementation, GrantedAuthorityImpl. This allows any user-specified String to be converted into a GrantedAuthority. All AuthenticationProviders included with the security architecture use GrantedAuthorityImpl to populate the Authentication object. As we've also seen in the Technical Overview chapter, Spring Security provides interceptors which control access to secure objects such as method invocations or web requests. A pre-invocation decision on whether the invocation is allowed to proceed is made by the AccessDecisionManager. The AccessDecisionManager's decide method is passed all the relevant information it needs in order to make an authorization decision. In particular, passing the secure Object enables those arguments contained in the actual secure object invocation to be inspected. For example, let's assume the secure object was a MethodInvocation. It would be easy to query the MethodInvocation for any Customer argument, and then implement some sort of security logic in the AccessDecisionManager to ensure the principal is permitted to operate on that customer. Implementations are expected to throw an AccessDeniedException if access is denied. The supports(ConfigAttribute) method is called by the AbstractSecurityInterceptor at startup time to determine if the AccessDecisionManager can process the passed ConfigAttribute. The supports(Class) method is called by a security interceptor implementation to ensure the configured AccessDecisionManager supports the type of secure object that the security interceptor will present. Whilst users can implement their own AccessDecisionManager to control all aspects of authorization, Spring Security includes several AccessDecisionManager implementations that are based on voting. Figure 13.1, “Voting Decision Manager” illustrates the relevant classes. Using this approach, a series of AccessDecisionVoter implementations are polled on an authorization decision. The AccessDecisionManager then decides whether or not to throw an AccessDeniedException based on its assessment of the votes. Concrete implementations return an int, with possible values being reflected in the AccessDecisionVoter static fields ACCESS_ABSTAIN, ACCESS_DENIED and ACCESS_GRANTED. A voting implementation will return ACCESS_ABSTAIN if it has no opinion on an authorization decision. If it does have an opinion, it must return either ACCESS_DENIED or ACCESS_GRANTED. There are three concrete AccessDecisionManagers provided with Spring Security that tally the votes. The ConsensusBased implementation will grant or deny access based on the consensus of non-abstain votes. Properties are provided to control behavior in the event of an equality of votes or if all votes are abstain. The AffirmativeBased implementation will grant access if one or more ACCESS_GRANTED votes were received (i.e. a deny vote will be ignored, provided there was at least one grant vote). Like the ConsensusBased implementation, there is a parameter that controls the behavior if all voters abstain. The UnanimousBased provider expects unanimous ACCESS_GRANTED votes in order to grant access, ignoring abstains. It will deny access if there is any ACCESS_DENIED vote. Like the other implementations, there is a parameter that controls the behaviour if all voters abstain. It is possible to implement a custom AccessDecisionManager that tallies votes differently. For example, votes from a particular AccessDecisionVoter might receive additional weighting, whilst a deny vote from a particular voter may have a veto effect. The most commonly used AccessDecisionVoter provided with Spring Security is the simple RoleVoter, which treats configuration attributes as simple role names and votes to grant access if the user has been assigned that role. It will vote if any ConfigAttribute begins with the prefix ROLE_. It will vote to grant access if there is a GrantedAuthority which returns a String representation (via the getAuthority() method) exactly equal to one or more ConfigAttributes starting with the prefix ROLE_. If there is no exact match of any ConfigAttribute starting with ROLE_, the RoleVoter will vote to deny access. If no ConfigAttribute begins with ROLE_, the voter will abstain. Another voter which we've implicitly seen is the AuthenticatedVoter, which can be used to differentiate between anonymous, fully-authenticated and remember-me authenticated users. Many sites allow certain limited access under remember-me authentication, but require a user to confirm their identity by logging in for full access. When we've used the attribute IS_AUTHENTICATED_ANONYMOUSLY to grant anonymous access, this attribute was being processed by the AuthenticatedVoter. See the Javadoc for this class for more information. 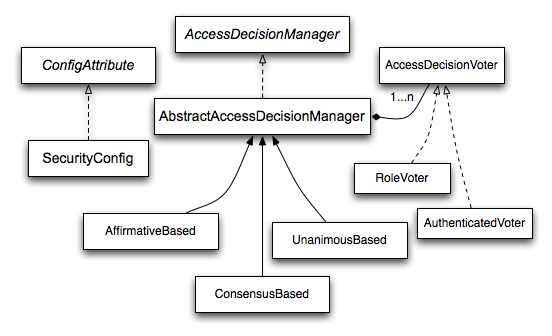 It is also possible to implement a custom AccessDecisionVoter. Several examples are provided in Spring Security unit tests, including ContactSecurityVoter and DenyVoter. The ContactSecurityVoter abstains from voting decisions where a CONTACT_OWNED_BY_CURRENT_USER ConfigAttribute is not found. If voting, it queries the MethodInvocation to extract the owner of the Contact object that is subject of the method call. It votes to grant access if the Contact owner matches the principal presented in the Authentication object. It could have just as easily compared the Contact owner with some GrantedAuthority the Authentication object presented. All of this is achieved with relatively few lines of code and demonstrates the flexibility of the authorization model. Whilst the AccessDecisionManager is called by the AbstractSecurityInterceptor before proceeding with the secure object invocation, some applications need a way of modifying the object actually returned by the secure object invocation. Whilst you could easily implement your own AOP concern to achieve this, Spring Security provides a convenient hook that has several concrete implementations that integrate with its ACL capabilities. Figure 13.2, “After Invocation Implementation” illustrates Spring Security's AfterInvocationManager and its concrete implementations. Like many other parts of Spring Security, AfterInvocationManager has a single concrete implementation, AfterInvocationProviderManager, which polls a list of AfterInvocationProviders. Each AfterInvocationProvider is allowed to modify the return object or throw an AccessDeniedException. Indeed multiple providers can modify the object, as the result of the previous provider is passed to the next in the list. Please be aware that if you're using AfterInvocationManager, you will still need configuration attributes that allow the MethodSecurityInterceptor's AccessDecisionManager to allow an operation. If you're using the typical Spring Security included AccessDecisionManager implementations, having no configuration attributes defined for a particular secure method invocation will cause each AccessDecisionVoter to abstain from voting. In turn, if the AccessDecisionManager property "allowIfAllAbstainDecisions" is false, an AccessDeniedException will be thrown. You may avoid this potential issue by either (i) setting "allowIfAllAbstainDecisions" to true (although this is generally not recommended) or (ii) simply ensure that there is at least one configuration attribute that an AccessDecisionVoter will vote to grant access for. This latter (recommended) approach is usually achieved through a ROLE_USER or ROLE_AUTHENTICATED configuration attribute.